Communication and teamwork skills as well as mathematical ability were key requirements at the regional round of the Senior Team Maths Challenge. The four-strong QE team scored 164 points out of a possible 172 in the closely fought event hosted by City of London School. 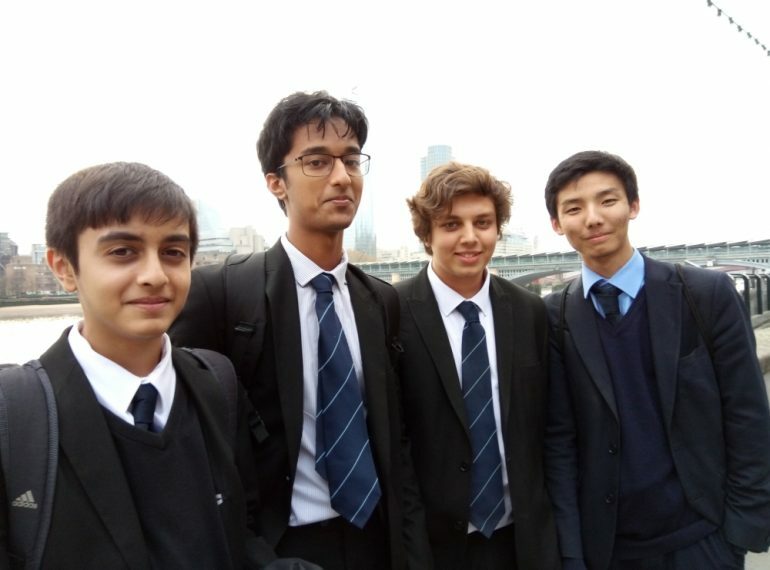 Representing QE in the competition run by the UK Mathematics Trust and the FMSP (Further Mathematics Support Programme) were Edward Hu, Bhavesh Patel, Suvir Rathore and Saruthan Seelan, all from Year 12. The competition offers pupils an alternative way to express and develop their enjoyment of Mathematics, as well as developing teamwork and communication. In the Shuttle, pairs answered questions alternately, with the answer to the previous question providing crucial information for the following one. The QE team came sixth out of the 30 teams who had entered. First place went to Highgate School, second to Dame Alice Owen’s School and third to the hosting independent boys’ school.